The Last Jedi … What’s Up in the World of Star Wars? Editor’s note: This piece is written by my young-ish daughter; please be kind with any comments. *Spoilers for The Force Awakens follow. First of all, I thought the beginning was really cool. I know I jumped when the creepy music led up to that moment when Rey falls on the ground gasping for breath. The real question was why this scene occurs, and I have an idea about that. During the trailer, Rey is saying what she sees while using the force (light, darkness, etc.). Since Rey hasn’t fully realized what she is capable of yet, I think she ends up falling and gasping for breath from using so much power at once, just like when Luke first started using the force and it was difficult for him. It also shows Rey using the force to lift rocks off the ground. All of Rey’s scenes show that she has grown more connected to the force, which definitely makes me more excited to see what happens with Rey. Another question a lot of people have been asking is since the trailer came out is, “What is a gray Jedi”? A gray Jedi is someone who is neither part of the dark side, nor the light side, or who walks the line between the two sides. Is Rey definitely a gray Jedi, though? I do think Luke is, but I am hoping for light Rey, all the way. Throughout the trailer there are many different speakers. Honestly, when I first watched it, I didn’t realize that Luke was the one who says “It’s time for the Jedi to end”, and not Kylo Ren. However, when I found out it was actually Luke, I did a double take. I’m not sure if I like that they are portraying Luke as a quitter. In the original trilogy, Luke was fearless, and was always fighting to help the Jedi. However in The Force Awakens Luke runs away because one of his apprentices turned against him, and now he wants to just give up on the Jedi. It just doesn’t seem right that Luke would do — or say — these things. 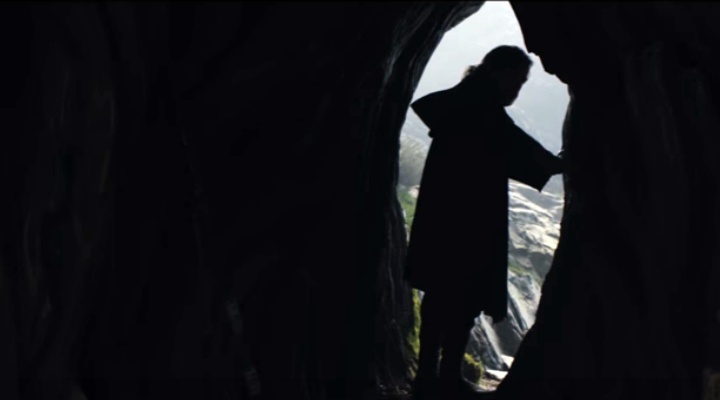 Many little things are revealed in the new teaser for The Last Jedi. Some of the things Star Wars fans are coming up with from the trailer interest me. 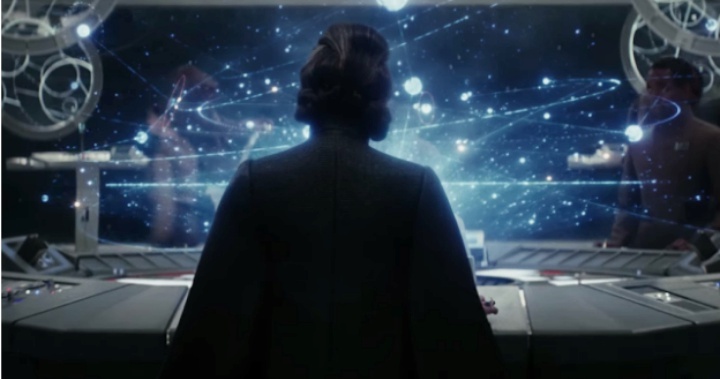 For example, when watching an easter egg version of the trailer, someone said that in the scene of Leia standing in front of a control panel, her hair is styled to look like the back of Darth Vader’s helmet. This is believed to be a hint that Leia is going to turn to the dark side. I feel like this could have been on purpose, or it could just be another one of the cool Leia hairstyles. Personally, I don’t think Leia would turn to the dark side. However, anything can happen in Star Wars! Another thing that was noticed is that in the middle of the trailer, there is a mask destroyed on the ground, which people believe is Kylo Ren’s mask. This does make sense because in TFA, Darth Vader’s helmet was already all deformed and worn out, while this mask looked like it was just recently broken. This makes us question, does something happen to Kylo Ren? Fans have also figured out that when we see the scene where Finn is laying on what looks like a hospital bed, the weird code on the side spells out “stable.” This means that Finn is going to be okay (yay!). My only question is, will Finn still be an involved main character, or will he be in a coma for half of the movie? I know I want to see more of Finn! Even though it was a short trailer, it had a lot of little hints. I am really excited for The Last Jedi to come out, and I know it is going to be good. I can’t wait to uncover more secrets when we get more trailers and information. In the meantime, we can all get excited for Guardians of the Galaxy: Vol. 2!!! Tags: Carrie FisherDaisy RidleyDarth VaderDarth Vader's helmetDisneyDoes Leia turn to the dark side in The Last Jedi?Does Leia's hair look like Dark Vader's mask in The Last Jedi?FinnGeneral LeiaIs Luke a gray Jedi?Is Rey a gray Jedi?John BoyegaLucasfilmLuke SkywalkerReyRey moves rocks with the forceStar WarsStar Wars: The Force Awakensthe dark sideThe ForceThe Force Awakensthe light sideWhat is a gray Jedi?Why is Rey gasping for breath in The Last Jedi trailer?Why is Rey gasping in The Last Jedi?